Easy Dinner from Thyme for Cooking: Stuffed Acorn Squash. The squash bakes while the stuffing is prepared and just needs 10 minutes to finish. I usually can't get all of the stuffing in, so I keep it warm and serve it on the side. 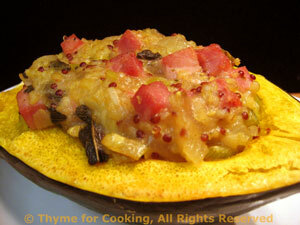 The salty ham and slightly crunchy quinoa contrast well with the sweet squash. And, yes, the mustard works too! Cut squash in half and scoop out seeds. Either place face down on tray and microwave for 10 - 12 minutes or put into a baking dish, cover with foil and bake in 400F (200C) oven for 40 minutes. Chop the onion and celery; mince the garlic. Heat the oil in a nonstick skillet over medium heat. Sauté the onion and celery 5 minutes then add the garlic. Sauté 5 more minutes or until onion and celery are tender and starting to brown. Cut the ham into small cubes, about 1/3" (1cm). Add ham and sage and sauté until ham starts to brown. Add mustard and chicken stock and stir well to combine. When ham mixture is simmering stir cornstarch in, a little at a time. (You may not need it all). You want it very thick but not paste. When quinoa is done add it to ham mixture and stir to combine. When squash are ready (they should be tender, almost done) remove from wherever they cooked and fill with the quinoa/ham mixture. Bake (not microwave for this last bit) uncovered for 10 minutes, until heated through and squash is done. No, we're not making Caramel Apples.... We're only two, after all. Buy one or two at your local market. To make them easier to eat, slice them into quarters before serving.